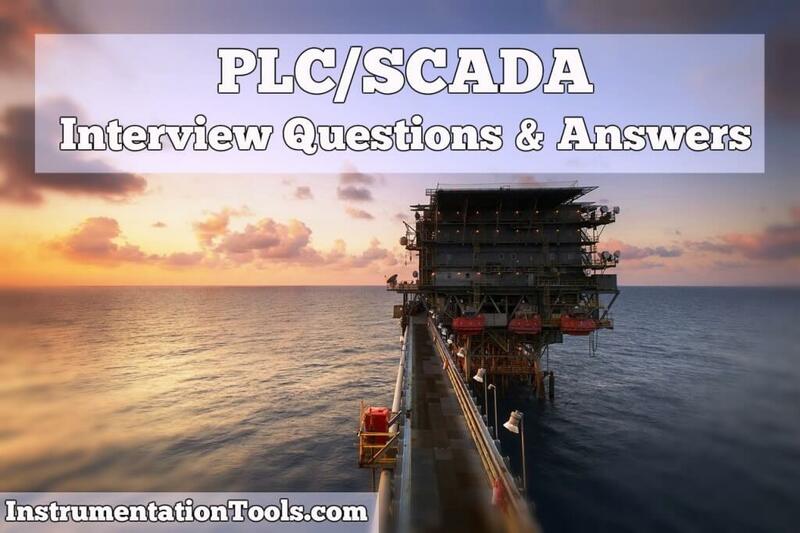 This article covers the topics of PLC SCADA Engineers Interview Questions. PLC means Programmable Logic Controller. It is a class of industrially hardened devices that provides hardware interface for input sensors and output control element. PLC Senses the input through I/P modules, Processes the logic through CPU and memory and gives output through output module. PLC can be used in almost all industrial application solutions right from small machine to large manufacturing plants. Even it caters applications of redundant systems at critical process plants. This component act as a brain of the system. CPU consist of Arithmetic Logic Unit, Program memory, Process image memory, Internal timers and counters, flags It receives information from I/P device, makes decisions depending upon the information and logic written and sends information through the O/P devices. Power supply provides system power requirement to processor, I/O and communication modules. A hardware assembly, which houses the processor, communication and I/O modules. This module is inserted into processor system for maintaining a copy of project (PLC program). This is helpful in case of memory corruption or Extended power loss. Communication modules are used either for communication between external hardware or software. The hardware can be PLCs (same or other make), Controller, I/O module, smart transmitters. The software can be SCADA software, MIS system or programming software. Distributed/Remote – These are the I/O placed at remote location from the main rack containing the CPU. These I/O’s are to be connected on communication bus like control net, device net or FIP I/O. It is the minimum change in i/p parameter which can sensed by the i/p card. As far as Digital I/O is concerned it takes only one bit for operation. In case of analog input the resolution determines how much bits are used for input or output. What is an Analog Input Module ? An I/O module that contains circuits that convert analog input signals to digital values that can be manipulated by the processor. The signals for pressure, flow, level, temperature transmitters are connected to this module. What is Analog Output Module ? An I/O module that contains circuits that output an analog dc signal proportional to a digital value transferred to the module from the processor. By implication, these analog outputs are usually direct (i.e., a data table value directly controls the analog signal value). Forcing the I/Os means making the desired status of I/O in PLCs irrespective of its status coming from the field. In certain cases when there is problem in receiving field input /output, we can force the i/Os so that the logic takes desired state. What is typical scan time in PLCs ? What effects scan time ? How to program PLCs ? Every PLC manufacturer have their own software for programming the PLC. For example Siemens uses Simantic S7 Manager, Allen Bradley uses RS Logix and Modicon uses PLC pro programming software. This is a programming language, which expresses a program as a series of “coils” and “contacts”, simulating the operation of electromechanical relays. The resultant program is the equivalent of an equation, which is executed continuously in a combinatorial manner. The advantage of this language is the familiarity many electricians have with the simple operation of relays. Disadvantages include the complexity of large, cross-connected programs, and the difficulty of expressing such non-binary functions as motion control and analog I/O. Redundancy means provision for standby module. In case of failure of one module is running process, the standby module takes over. I/O Redundancy : Multiple I/O channels are provided to take care of input or output failure. This acts as an operator station. The operator can monitor as well as control the process parameters from this stations. Apart from online process data the operator will have access to historical and real-time trends, alarms and reports. The operator can give commands to control hardware for opening the valve, change the set point, start the pump etc..
Symbol Factory contains symbols which can be readily used in the application. The symbols is contains include various Tanks, Reactor, Pipes, Icons, Flags. Historical trends provide you with a “snapshot” of data from a time and date in the past. They are not dynamic. Unlike real-time trends, historical trends are only updated when they are instructed to do so either through the execution of a QuickScript or an action by the operator, for example, clicking a button. You can zoom in / zoom out the trends. You can also access the previous data. Alarms are the notifications used to inform operators of process activity: Alarms represent warnings of process conditions that could cause problems, and require an operator response. A typical alarm is triggered when a process value exceeds a user-defined limit. InTouch uses for types of alarms are LOLO, LO, HI and HIHI. Security provides the ability to control whether or not specific operators are allowed to perform specific functions within an application. When a new application is created, the default “User Name” is “Administrator” with an access level of 9999 (which allows access to all security commands). Application : Linked to the entire application. Window : Linked to a specific window. Key : Linked to a specific key or key combination on the keyboard. Condition : Linked to a discrete tagname or expression. Dynamic Data Exchange is the facility developed by Microsoft for exchanging the data between various programs. How to have two way communication between Excel and InTouch ? Create a I/O Tag Name with following detail Application name : Excel Topic Name : [XXXX.xls]sheet1 i.e XXXX.xls is actual excel file used in application. Sheet 1 is the spreadsheet where the data is kept. Item Name : R1C1 ie Actual Address of the Cell where the data is kept.